One of my favorite things to do when I have a little extra ‘me time’ is to pamper my skin with a hydrating facial mask. They’re an easy and relaxing way to quench my skin and give it that extra boost. While most masks have a singular objective, like providing intense hydration, brightening or calming effects, one brand stands out for addressing our different ‘skin-uations’ – let’s take a look! Each When mask is made from fermented coconut juice (a.k.a. bacterial cellulose) which boasts ‘high purity, strength, moldability, adhesion and increased water holding ability’. Their all-natural bio-cellulose sheets can hold essence 100x its weight – that’s 10x more than fabric or paper mask sheet! Due to their close contact with the skin, they effectively deliver nutrients by first trapping the formula, and then forcing it to absorb and seal in moisture. Use the extra serum all over your body. The pool of serum left in the pouch should be used to give your neck, hands, arms, legs, feet and what-not a taste of love as well. Use a face oil afterwards. Applying a drop or two of your favorite face oil after using When masks will enhance the effect of the treatment. Watch the clock. Leaving on the mask for longer than the recommended time may increase the temperature of the skin and can lead to a rise in bacteria count on the skin, causing acne and other malicious problems. And please DON’T FALL ASLEEP wearing When masks. Each When sheet mask comes thoroughly soaked in serum – or should I say drenched. They didn’t skimp out on product with these, so there’s plenty extra to apply over your neck and décolleté. The mask material is pretty unique in itself – it’s thick with a slightly ‘gummy’ feel to it which, when applied, gently molds and adheres to the face with precision. Once on, this mask sticks so well that you can walk around the house and multitask without having to worry about it falling off. It also has the faintest scent, which to me smells a lot like gummy bears – pleasant, but I could do without it (personally, I’d love if they made a fragrance-free version). The size of the masks is slightly smaller than other ones I’ve tried – the eye holes are a bit narrow and the fabric gaped a bit at the sides of my nose. But other than that, they fit perfectly – covering all the right areas. Out of the 5 masks that come in When’s ‘Special Package’, I decided to try out the ‘Snow Magic’ first, which is their brightening mask, followed by 10:00pm, a restorative, hydrating mask. After applying the ‘Snow Magic’ mask for the recommended 30 minutes, I was disappointed to find that my skin still felt tight. Even though this is a brightening mask, it still should have hydrated my skin enough to take the place of a moisturizer. When it came to the mask’s brightening effects, I didn’t notice any significant difference afterwards – at least nothing like I’ve seen from my all-time favorite brightening mask – the SK-II Facial Mask. Overall, for my first go, I wasn’t too impressed with my results. 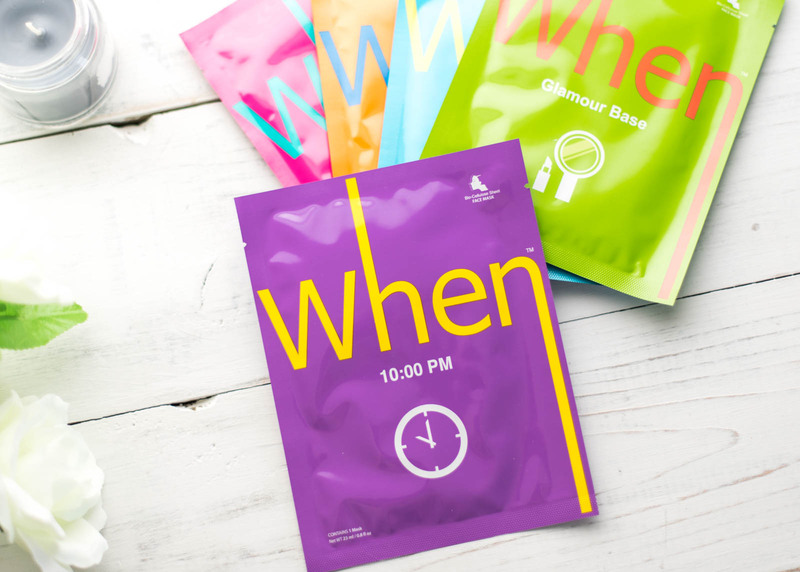 I decided to try out When’s ultra-hydrating and restorative mask next – the 10:00pm mask – thinking that it might just be a better ‘match’ for my current ‘skin-uation’. When it came to the 10:00pm mask, I ended up leaving it on for a good 45 minutes. Between the super hydrating effects of the mask and that extra 15 minutes, I noticed a dramatic difference in my skin. My skin felt incredibly moisturized, plump, and refreshed. I didn’t feel the need to apply extra product either. There was a slight sticky feeling to the skin afterwards, however, that dissipated once the rest of the serum absorbed (about 15-20 minutes later). Overall, I have to say the 10:00pm mask absolutely satisfied my skin’s thirst for deep hydration after, quite literally, a long day. It may have taken a full hour for this treatment, but if you have the time to spare in the evening, it is well worth it! While the When sheet masks offer a range of different masks to fit different situations, it really all comes down to hydration, and sadly, that’s where some of them fell short. The 10:00pm mask was the one exception – it delivered, and is by far my favorite mask for intense hydration. However, when it comes to more advanced effects like brightening + hydration, I’d recommend going with a brand that specializes in that particular type of formulation. When masks are available at Sephora, Ulta, Anthropologie (online only), Bartell Drugs, Beautychoice.com (online only), Birchbox (online only), Rickys NYC, and Starboard Cruise Services. Are facial masks a part of your regular skincare routine?